Let us proudly introduced our lovely Prince No. 2, Little Wai boy who was born in the Year of Snake (Year 2013). ﻿﻿﻿﻿﻿﻿He is not only the youngest in our family but also in the whole Mak's family at this point in time. Little Wai boy was actually due to be born only on 6 June 2013 but Mommy opt to go for caesarean 2 weeks before the EDD in May 2013. Same as his brother, Wai boy was born in Gleneagles Intan Medical Centre Kuala Lumpur. 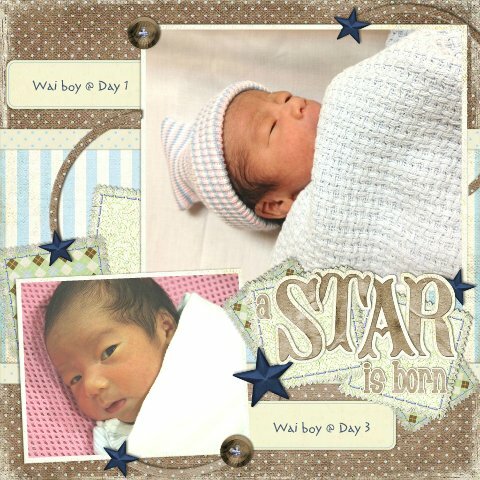 Weighing at 2.910kg and 48cm long, Wai boy was born healthily at 8:42a.m. achieving an Apgar scores of 9. On 25 May 2013, Little Wai boy together with Mommy were discharged from the hospital and travelled in a car for the very first time driven by Daddy reaching home safely at about 3:00pm. Here's some gifts given upon discharged. Thanks to Baiboo and Gleneagles Kuala Lumpur. Mommy created this lovely blog for you today mainly is to jot down every single little thing that relates to you starting from the day you were born as I can never afford to forget your growing-up days when I aged. Hence, this journal will definitely serves as a good reminder, hopefully not only to me, but also valuable to you. Love from Daddy & Mommy"
I am the youngest in my family and my Mommy has created this lovely blog just to jot down every single thing about me.